Folic acid interacts with vitamin B12 for the synthesis of DNA, which is necessary for all of the cells in the body, as well as for the breakdown of proteins and the formation of hemoglobin, a compound found in red blood cells that transports oxygen and carbon dioxide. Folic acid is important for the production and maintenance of new cells, especially during both pregnancy and infancy when cell growth is extremely rapid. Adults and children need folic acid to make normal red blood cells and to prevent anemia. Having enough folic acid in early pregnancy can prevent birth defects, including problems with the spine (neural tube defects) and brain. The human body stores several years’ worth of vitamin B12, so nutritional deficiency of this vitamin is extremely rare. Deficiencies are found mainly in alcoholics, the malnourished, the poor and the elderly. Strict vegetarians or vegans who are not taking in proper amounts of B12 are also prone to a deficiency state. Deficiency can cause diarrhea, anemia, loss of appetite, weight loss, sore tongue and a may cause birth defects such as spina bifida and anencephaly in a developing fetus, numbness and tingling of the arms and legs, difficulty walking, memory loss, disorientation, and dementia with or without mood changes. No toxic or adverse effects have been associated with large intakes of vitamin B12 from food or supplements in healthy people. Vitamin C is required for the synthesis of collagen, an important structural component of blood vessels, tendons, ligaments, and bone. Vitamin C is essential for the healing of wounds, and for the repair and maintenance of cartilage, bones, and teeth. It also has an important role in the synthesis of norepinephrine, a neurotransmitter. Neurotransmitters are critical to brain function and are known to affect mood. It is also necessary for converting fat to energy. Vitamin C is a highly effective antioxidant that may be able to regenerate other antioxidants like Vitamin E. Vitamin C deficiency is also known as scurvy, a potentially fatal disease whose symptoms include bleeding and bruising easily, hair and tooth loss, joint pain and swelling. Other possible problems resulting from vitamin C deficiency are heart disease, stroke, cancer and cataracts.In tests, vitamin C has resulted in improved dilation of blood vessels in individuals with atherosclerosis, angina pectoris, congestive heart failure, high cholesterol, and high blood pressure. Studies in the 1970’s and 1980’s conducted by Linus Pauling and colleagues suggested that 10 grams a day, taken intravenously for 10 days followed by at least 10 grams a day taken orally indefinitely, were helpful in increasing the survival time and improving the quality of life of terminal cancer patients.Vitamin C deficiency can cause dry hair that splits easily, gingivitis, gum disease, easy bruising, nosebleeds, swollen joints, anemia, lowered immune function, slowed metabolism. Unlike most mammals, the human body does not manufacture or store vitamin C on its own, so it is important to include plenty of vitamin C-containing foods in your daily diet. This means that vitamin C toxicity is very rare, but taken in large doses, it may cause stomach upset and diarrhea. Imagine if you ate 6 oranges a day. It can get messy! Vitamin D is found in food, but also can be made in your body after exposure to ultraviolet rays from the sun. The liver and kidney help convert vitamin D to its active hormone form which helps to maintain normal blood levels of calcium and phosphorus. It aids in the absorption of calcium and helps form and maintain strong bones and promotes bone mineralization along with a number of other vitamins, minerals and hormones. Without vitamin D bones can become thin, brittle, soft, or misshapen. Vitamin D prevents rickets in children, which results in skeletal deformities and osteomalacia in adults, which results in muscular weakness in addition to weak bones. As we age, the ability of skin to convert vitamin D to its active form decreases, and often the kidneys, which also convert vitamin D to its active form, don’t work as well. Current research suggest that Vitamin D deficiencies are associated with at least 17 varieties of cancer as well as heart disease, stroke, hypertension, autoimmune diseases, diabetes, depression, chronic pain, osteoarthritis, osteoporosis, muscle weakness, muscle wasting, birth defects, periodontal disease, and more. It is highly unlikely that you will consume too much vitamin D from the diet alone unless you regularly consume large amounts of cod liver oil. Usually it will occur when too many vitamin D supplements are consumed. Too much Vitamin D can cause nausea, vomiting, poor appetite, constipation, weakness, weight loss, raised blood levels of calcium which can cause mental status changes such as confusion, heart rhythm abnormalities and calcinosis. 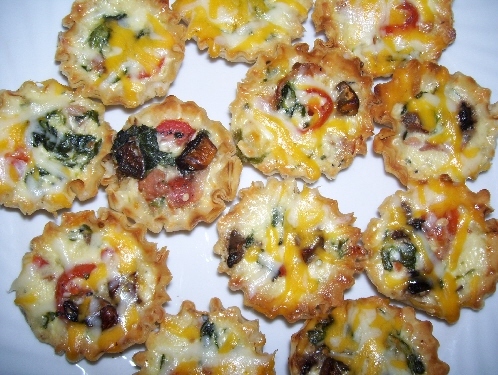 Mini-quiche made with fresh eggs and milk, real cheese and loaded with spinach, tomatoes, portobello mushrooms. This breakfast treat is packed with vitamins and nutrients! The term vitamin E describes a family of 8 antioxidants, 4 tocopherols and 4 tocotrienols. Alpha-tocopherol, whose main function in humans seems to be as an antioxidant, is the only form of vitamin E that is actively maintained in the human body; therefore, it is the form of vitamin E found in the largest quantities in blood and tissues. Vitamin E is also important in the formation of red blood cells and helps the body to use vitamin K.
Vitamin E deficiency is rare, but has been observed in individuals with severe malnutrition, genetic defects affecting the alpha-tocopherol transfer protein, and fat malabsorption syndromes. Severe vitamin E deficiency results mainly in neurological symptoms, including impaired balance and coordination, injury to the sensory nerves, muscle weakness, and damage to the retina of the eye. A deficiency is also linked to cardiovascular disease, cataracts, immune function, dementia and cancer. In November, 2004, the American Heart Association stated that high amounts of vitamin E can be harmful. Taking 400 IU per day, or higher, may increase the risk of death. Vitamin K is known as the ‘clotting vitamin’, because without it blood would not clot. It is also known to help protect against osteoporosis and to help prevent oxidative cell damage. Additionally, vitamin K appears to be important for the formation of cartilage and dentine, part of teeth.